In the late 19th Century, before the advent of antibiotics, those infected with tuberculosis were isolated and treated in sanatoria, also called "consumptives' homes." The infected poor were pressured to enter sanatoria that resembled prisons, while consumptives of the middle and upper classes were placed in more comfortable homes which provided excellent care and constant medical attention. Whatever the purported benefits of the fresh air and labor in the sanatoria, even under the best conditions, 50% of those admitted were dead within five years. 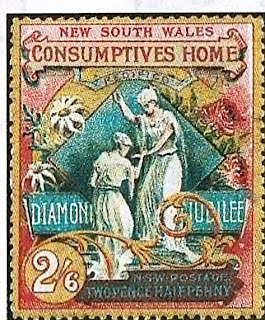 In 1897, the Australian State of New South Wales issued a pair of semi-postals in celebration of Queen Victoria's Diamond Jubilee (Scott #B1-2). 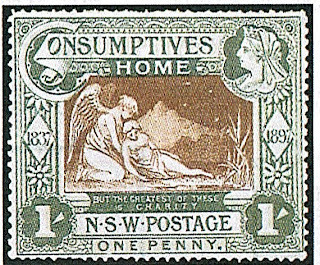 These attractive, Art Nouveau-style stamps cost 1sh and 2sh6p and had a postal value of 1p and 2 1/2p, and the difference between the cost and postal value was donated to a fund for a home for consumptives. 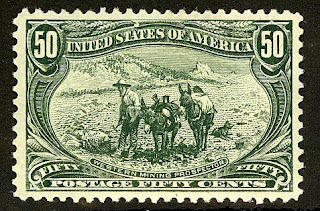 40,000 of the 1p(1sh) and 10,000 of the 2 1/2p (2sh6p) stamps were issued, and Scott' 10 values the set at $ 362.50 for unused. These semi-postals are often either poorly centered or have condition problems, so endeavor to purchase the set in sound, Fine or better condition if you run into it. I will continue to focus on better, undervalued stamps of Australia and it states, as their values have nowhere to go but upward. Both the country's economy and its stamp collecting population are set for a multi-decade rise. Furthermore, this set qualifies as a Medicine Topical, and its value should be given an additional boost due to another long-term trend - the increasing demand for doctors and health care professionals. Australia is a prosperous nation of 22 million people and a diverse economy, with thriving service, agricultural, and mining sectors. Annual GDP growth has averaged 3.6% over the past 15 years. Recently, there has been considerable growth in mining and petroleum extraction, in part due to increased exports to the resource-hungry Chinese market. It is likely that Australia's stamp collecting population will grow significantly as the nation ages. The percentage of Australians over 60 is projected to rise from 16% in 2000 to 24.8% in 2025, and 28.2% in 2050. Many will find playing with their stamps a pleasant diversion while "camped by a billabong, under the shade of a coolibah tree." I just read through your whole blog and enjoyed it very much. I will definately look out for some of the (lower priced) stamps you mention for investment. What do you think of Canada #411 as one to watch? I have read elsewhere that it was under valued. I like many of the better items of Canada and BNA, especially some of the back-of-book Canada, and obscure stuff like the semi-official airs, as well as alot from the provinces. The modern dollars values, however, had relatively high printing quantities, and I'd rather put money into the scarcer stuff for the long-term. My attitude toward the modern dollar values (#s 227,245,262,321,411, etc.) is that if you can buy them dirt-cheap and re-sell them, do so, but consider them for short-term trades, as there are better, more undervalued items out there.